In the lead-up to the SOAS Centenary in 2016, we will be taking a look at the history of the School through collections held at SOAS Archives. This week, the School’s Corporate Records Manager & Archivist, Adele Picken, looks at the papers of Edward Denison Ross, first Director of the School of Oriental Studies (later School of Oriental & African Studies), 1917-1938. Denison Ross was born in London on 6 June 1871. He was educated at Marlborough College, Wiltshire, and later at University College London, before going on to study languages in Paris and Strasbourg, being awarded a Doctorate in Persian from Strasbourg University in 1894. In 1896 he was appointed Professor of Persian at University College London and remained there until 1901 when he took up an appointment as Principal of the Calcutta Madrasah Muslim College, the city’s chief educational centre for teaching Arabic and Persian. In 1911, this role was combined with that of Officer in Charge of the Records of the Government of India and Assistant Secretary in the Department of Education. As a Fellow of Calcutta University and an active member of the Asiatic Society of Bengal, he did not confine himself to Islamic Studies but gained some knowledge of Sanskrit and Chinese and a more profound knowledge of Tibetan. In 1914 Dension Ross returned to the UK and became First Assistant at the British Museum, working in the Prints and Drawings Department cataloguing the Stein Collection. During this time, Denison Ross also supported the war effort by working for the Postal Censorship and the Department of Military Intelligence preparing vocabularies in several languages. Denison Ross became the first Director of the School of Oriental Studies (later the School of Oriental and African Studies) in 1916, when the School opened. At the same time he became Professor of Persian at the School. The time he served as Director was a turbulent one, with the School facing initial financial difficulties having opened £36,267 short of the initial funding target. This problem was compounded by the School opening during the First World War when finance and available teaching staff were in short supply. It is therefore an attribute to Denison Ross that the School not only remained afloat during this time but also expanded – by the time he retired in 1938, the School had taken over 7,000 students. Whilst he was at the School, Denison Ross also built up a library with over 13,500 works. 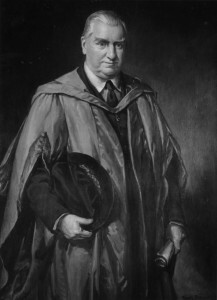 During the majority of his service as Director, the School was based in Finsbury Circus, later moving to temporary accommodation in Vandon Square when the building was sold in 1935, and whilst waiting for building works to begin on the current site in Bloomsbury. Denison Ross remained Director of the School until his retirement in 1938, when he was made Emeritus Professor. In 1939 he soon took up the position of Head of the British Information Bureau in Istanbul to assist with the development of Anglo-Turkish relations. Whilst there, his wife, Lady Dora Ross, died at the age of 70. Only a few months later, Denison Ross also passed away in Istanbul on 23 September 1940, at the age of 69. Denison Ross was a brilliant linguist with knowledge of over 40 languages, 14 of which he could speak fluently. He specialised in Arabic and Persian and was the first Briton to broadcast messages in these languages from England. He spent 26 years translating a 16th century Arabic history of Gujarat (North India). He also had an interest in Portuguese, studying the Portuguese language and its customs throughout his life and becoming a member of the Portuguese Academy. He said that Japanese, Welsh and Hungarian were the languages that caused him the most difficulty. His wife, Dora, whom he married in 1904, was also a gifted linguist and could speak 12 languages fluently. In his obituary in the Evening Standard on 20 September 1940, Denison Ross was described as ‘short and stout with a curved nose and twinkling eyes’. He was known as an admirable speaker with great humour and wit, as well as a gifted linguist. The personal papers of Edward Denison and Dora Ross (Ref: PP MS 8), which can be seen at SOAS Archives, contain correspondence, lecture notes, language material and personal material of Denison Ross and his wife, Lady Ross, relating to his academic work as a linguist. The collection also includes notes of J. A. Chapman, gathered whilst editing Denison Ross’s autobiography Both Ends of the Candle, published after his death in 1943.